Editor’s Note: A survey taken in 2013 showed that although the oil production practice called fracking has stirred up a storm of controversy in our country the majority of Americans have little or no idea of what the practice itself consists of. We’re reprinting this article from The Greeley Tribune in an effort to remedy this ignorance. — Hardly Waite. Fracking, the two- to three-day process of hydraulic fracturing for oil and gas, is perhaps one of the most misunderstood drilling practices, becoming as bad of a word in some circles as a racial slur. Entire countries have banned the process. Some Colorado towns have placed moratoriums to study it further. Environmentalists storm capitals over it, demanding increased regulations, and oil and gas company employees and officials scratch their heads — they’ve been using the same process in oil and gas drilling for 60 years without widespread incidents. 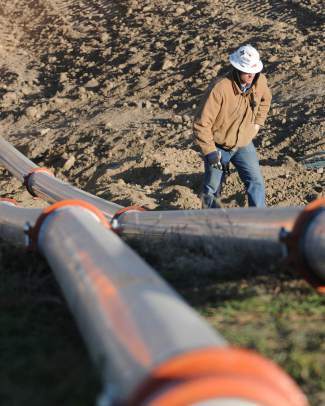 Huge pipes lead down a hill to provide water to a fracking site. a company fracking job last fall to a student tour from the University of Northern Colorado. “People go to a light switch and expect energy to be there, but they don’t think about where it comes from. I don’t think most people understand that without hydraulic fracturing, we wouldn’t have natural gas to provide electricity to our homes or gas in our cars. A recent study by researchers at Oregon State, George Mason and Yale universities revealed that more than half of the 1,000-plus people surveyed across the nation had no idea what fracking was, and almost 60 percent had no opinion on it. In recent years, combining hydraulic fracturing with horizontal drilling is what has allowed for the oil and gas revolution that many in the industry say will pull America away from the Middle East in terms of long-term resources and energy independence. It’s important to understand that fracking is a small part of a much larger operation to get oil and gas from a mile below the surface into storage tanks for market. Fracking takes about two to three days in what is roughly a 10- to 14-day process of drilling and completing a well. “Fracking is one of the important parts of this,” said Leen Weijers, vice president of technology and sales for Liberty Oil Field Services, a private contractor that fracs wells for oil and gas exploration companies. Fracking has always been a part of drilling. The new part of the process is horizontal drilling. Companies start the drilling process on about a 3-acre pad of land, which allows for the many trucks that become part of an oil and gas drilling process. The process begins with vertical drilling. A drilling rig is brought on site to drill the well, which will go to depths of up to 10,000 feet below the surface. This process can take from a week to 10 days, depending on the site. Drilling stops initially below the water table so the well can be encased in cement to prevent anything from the well leaking into the water table. Once the casing is completed, a 7-inch drill bit will drill more than a mile to get to the formation in which to frac, usually the Niobrara or Codell formations, both stacked beneath several impermeable rock formations. Once the drill bit hits bottom, or the “pay zone,” the company will drill what is called the “bend,” which is the curve the well takes to get into the horizontal portion of the zone. The bend alone could take up to two days to drill. Throughout the drilling process, drilling mud is pumped in to cool the drill bit and act as a means for the resulting debris to leave the well. Up to twelve semi trucks all running together provide the horsepower to the wellhead for the fracking process. The horizontal portion of the well then is drilled for an additional 4,000 feet to 10,000 feet, then encased in cement, with a 4-inch metal pipe in the center to allow for the oil and gas to flow to the surface. At this point, the well is just a hole drilled into the ground, with a cement barrier between the pipe, the formations and water table. The rig is packed up and activity stops until fracking is scheduled. Sometimes it can wait for weeks before a fracking crew is able to get there. Sometimes it takes a couple of days. 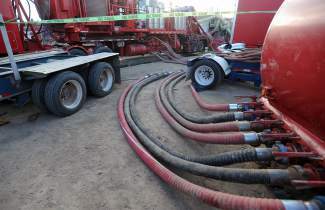 The actual fracking process uses a lot of machinery capable of driving the fluid down more than a mile, and a lot of science to calculate the exact mixtures of everything from chemicals and water and sand to the pressure it takes to crack tiny little fissures into rocks, more than a mile beneath the surface. Sand, water and chemical additives are pumped into the well at high pressures, so as to crack the rock in different stages in the horizontal (parallel to the surface) portion of the well. “To open fractures at bottom-hole pressures in the Niobrara, you probably need downhole pressures of 10,000 psi or so to open the rocks,” Weijers said. The chemicals do not erode the rock to create the cracks or fracs — it’s the high pressure of the water that opens them up. The chemicals, such as guar gum, which also are in many foods we eat, are added to help the water to gel, allowing the sand an easier vehicle in which to move. Those cracks, now held open by the tiny kernels of sand, release the trapped oil and gas inside, which flow back to the surface after the downward pressure from fluids is released from the well. Soap ingredients also can be added to the gel to prevent bacterial growth in the well. If bacteria forms, it could release deadly gases. Many involved in the process describe frac fluid as “slime,” like the stuff kids play with from the local toy store. To handle the sand, water, chemicals and production that comes out of the well during the fracking of the well (commonly called flowback), the site needs have the basics: Trucks, trucks and more trucks to carry the water, the sand, and the chemicals to mix them all together, and more truck horsepower to combine it all to shoot down through a pipe into an 8-inch hole in the ground. To prep the area, several 500-barrel tanks for water storage or a massive, 40,000-barrel pool to store water is erected on the periphery of the site. Sand storage tanks arrive, then are filled. A typical frac job will utilize from 1.5 million to 6 million pounds of sand. Iron trucks carry massive amounts of pipe that will be used to keep the well opened and separate from the well. “When the rest of the crew arrives on location, they’ll typically rig up to the well head with a missile,” Weijers said. The missile is a manifold around which most of the activity centers, to ultimately pump fracking fluid downhole. Crews will line on each side of the missile five to six semi trucks, which contain the horsepower to create enough pressure to pump the fluid downhole at the proper rate. In addition to the horsepower trucks, there are sand trucks and trucks containing the chemical additives to thicken the water to keep the sand moving in the well. A hydration truck, through which the chemicals are added to the water to “gel,” and a blender, which mixes that fluid with the sand, are nearby. All surround the missile in a horseshoe shape. That one process is good for one frac, or stage, at which the horizontal well is cracked from being hit at such high pressures. A typical well can have 20 fracs, each necessitating this procedure of blending, pressurizing and cracking. A typical frac job can last up to 20 hours — one frac stage per hour — from start to finish. At the open end, or the top of the horseshoe, is a data center, or a trailer containing about five to six people controlling the science of the job. There’s usually a representative or two from the oil and gas company, a frac job supervisor and an engineer to do the calculations. Here, employees track every aspect of the job, from pressures of the frac fluid to the diesel engine’s fuel gauges. At various other open areas, there will be containers in which the used sand and production waters are placed into once they fulfill their purpose in the wells to be hauled off later for recycling, injection or disposal. On jobs where crews utilize a large pool of water, the water is usually being heated to temperatures of about 70 degrees to provide the perfect chemical combination with the additives and sand. At some point in the drilling and completion process, crews will build oil and gas storage tanks, vapor recovery units to control air emissions, and oil and gas separators for the eventual well production. All will be strategically located around the wellhead. Once all the fracs are created, the downward pressure is removed from the well. Within a couple of days, the release of that pressure will reverse, allowing the oil and gas to flow from the rocks and up the well. All the equipment is removed from the site, leaving only the wellhead, the storage tanks, separators and emissions control. Production can last for years.